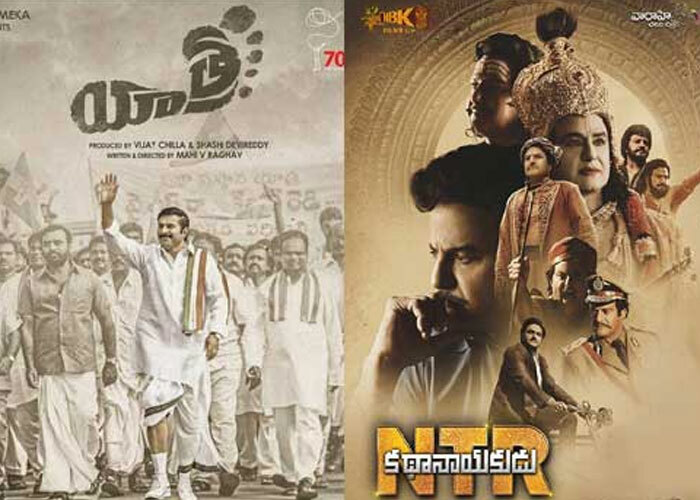 Within a short gap of four weeks, biopics of two political leaders late Ntr and late YSR hit the screens across Telugu states. Ntr Kathanayakudu stood as an all time disaster with 77% losses to buyers. Yatra had a decent share of Rs.3 crores world wide on its first day. However, given the charisma of YSR among the masses, Yatra's share is undoubtedly negligible. According to movie analysts, some common blunders were crept in both the films which can be treated lessons for other film makers who are making biopics. Checkout the following blunders of Ntr and Yatra. * In Kathanayakudu, late Ntr was flattered as 'Devudu' (god) which irked most of the audience. In Yatra, YSR was shown as a great personality but the Congress party which is represented by him, was shown as a villain for him. As a matter of fact, YSR had never ever given up his loyalties to the party until he breathed his last. * There were overboard cinematic liberties in Ntr. For an instance, Ntr doesn't close his eye lids for 24 hours nonstop which is an incredible feat for any human being on earth. Similarly, Yatra is also filled with too many cinematic liberties to glorify the acts of late YSR. * Above all, both TDP and YSRCP were behind the making of Ntr KN and Yatra for their political gains which eventually, vanished the creativity of directors. BOTTOM LINE: De facto, biopics are intended to instil confidence and inspiration among the people. The successes and failures of eminent personalities should genuinely be dealt by film makers. Then only, desired results are achieved with biopics. Nagababu: CBN's Blood Boils Only Then!